You are viewing all comments posted under Missouri. Ron Frazier a loving husband, father, and grandfather was also a man with a dedicated work ethic. He cherished spending time with his close and extended family, as well as helping those friends who needed a hand. Ron loved car cruises and traveling with his wife, Leanne. He enjoyed watching his son show horses or visiting their horse farm. He could frequently be found fixing someone’s car, a piece of equipment, or helping with an outdoor project at their home. He loved his family and was so proud of them. Ron was born in Colfax, Washington on March 31, 1946 to parents, Robert E. & Lillias Frazier. The family relocated to Missouri. Ron had 4 siblings; Delores, Roberta, Loretta, and John. At the age of 16, Leanne Dorsel caught Ron’s eye as she practiced cheerleading or catching some afternoon sun in her backyard that looked across to the Frazier family’s home. This began the friendship that would one day turn into something so much more. Ron graduated from Liberty High School in 1964 and went to work as an auto mechanic for his father at Frazier’s Auto Repair also in Liberty, MO. In 1965 the conflict in Vietnam had escalated to a critical level and Ron joined the army in October of that year. This began 3 years of service as a Construction Engineer/Heavy Equipment Operator. During Ron’s service to our country, on November 22, 1966 he made his former neighbor, friend, and girlfriend, his loving wife, now Leanne Frazier. After his honorable discharge, Ron returned to work at his father’s auto shop until his brother-in-law, Jim Robertson offered him a position at his company. That began Ron’s 41 year career with Robertson Plumbing working in all aspects of the plumbing trade. The company grew and together they built many of the homes and neighborhoods around the Kansas City area. This is where Ron’s work ethic really shined, always getting the job done to the highest standard and maintaining the plumbing vehicles and equipment as well as the most skilled backhoe operator. His dedication to his career and work ethic enabled Ron to provide a comfortable life for his family and teach his young children that hard work does pay off. 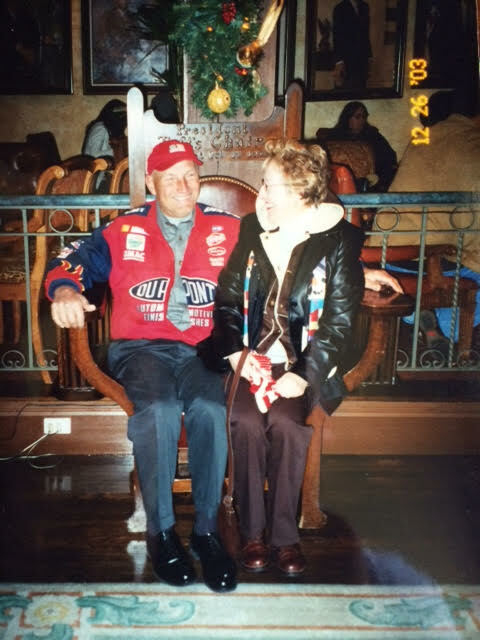 For 49 years, 5 months, and 4 days his marriage to Leanne was one of unconditional love and caring for each other, until his death Tuesday, April 26, 2016. With his wife and two sons beside him in his home, he began his journey to eternal life. A Husband, Father, Brother, Grandfather, Uncle and Friend to so many, Ron leaves behind many struggling with a heavy heart. These include his wife Leanne Frazier, son Daniel Frazier, his wife, Carla Frazier and their two children Dalton and Lilly Frazier. His son David Frazier, his partner, Pug Willis. His sisters Delores Geisinger, Loretta Karns, Roberta Vogt , and his brother John Frazier. His mother-in-law, June Dorsel. Ron was preceded in death by his parents, Robert E. & Lillias Frazier, his father-in-law, Robert E. Dorsel, and sister-in-law, Suellen Dorsel. Ron loved to work on old cars and his pride and joy was his red and white, 1955 Chevy. Over the years he lovingly restored and modified his ‘55. He enjoyed going to car cruises and valued his many friends. We're so happy to have privelidge to help you honor Ron! I was born and Army brat. My dad was a SSgt.at Camp Chaffee Arkansas in 1956. I have tried to serve our military in every way possible since then. I shake hands with every military member I see.Which when you consider that i live near and air base is a lot. I was also their Armed Forces Emergency Services Military Red Cross case manager for 8 yrs.. As well as those of several other units that were assigned to me because of some of the smaller offices not having a case worker. And I did it with pride. I have served with the United States Air Force Aux. Civil Air Patrol. There I encouraged all of my younger officers to get to know every military person and their families that lived near them or that they went to school with. These are the things my father taught me. Talks my other siblings are not even aware ever took place. He told me once I was the one to carry the light he passed to me through birth on a military post. When I was younger I did not understand all of this. But as I aged.I did as we all do. I had hoped Vietnam would of been my generations last war as well as our childrens. But world events changed that. So for all of those kaki diaper kids like myself I salute all of you and your loved ones who served. And for those younger kaki diaper kids coming up in the world today I give you my love and my love to those in your family who are currently serving.Have served.Or for those you have lost you have my deepest love and respect. To all who read this that are currently in Harms way, or to those who have returned and are trying to get your lives and those of your families back in order. I Honor You All. To my father I say Thank you for your love and your service. And for Those Who Gave All. R.I.P. Because of you I live in a Free and Honored Country. What a glorious tribute!! Thanks for setting an example by giving your time and words to honor those who gave so much. And thank you for your service! 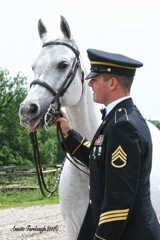 Equine-Assisted Therapy Veterans Program of St. Louis is proud to recognize and thank our courageous veterans and compassionate horses that make our program what it is. Thanks to both the veterans and the horses, physical and spiritual freedom is a true and enduring gift that can never be repaid. Thank you! Thank you for finding a way to help our veterans, it is so important that they know we are all there for them and appriciate all that they sacrifice for us. I come from a strong military family and know the sacrifices that the soliders and their families make. Special thanks to my Son-n-law who is deployed now (that is him with our Arabian on their wedding), my nephew who severed in Iraq and my daughter that is state side and gone but not forgotten my father and Uncle. God Bless all our military Freedom isn't free! WHAT AN AMAZING PICTURE! Both so handsome!